The Risdon Hotel opened in Moppett Road, Port Pirie West, in November 1877. The hotel was then known as the “Pilot Boat Hotel” and it was ideally situated to serve the rapidly growing residential areas of the town. It served as pub, club, meeting place, entertainment hall and polling booth for the western suburbs. Records indicate that W.O. Evans was the first licensee. An observatory capable of holding 100 people was built on the roof of the Pilot Boat Hotel. This was an ideal location to spot the sails of the windjammers coming up the gulf. The hotel has been rebuilt and remodeled a number of times. In 1915 it became known as the West Suburban Hotel and then in 1938 the existing building was completed with the distinctive art deco style of architecture. The hotel is one of the most distinctive examples of this architecture in the region. At the same time it was renamed Hotel Risdon. The Risdon Hotel played its part in Port Pirie’s colourful history and this is well recorded in Nancy Robinson’s book “Reluctant Harbour”. This way to the Boat. Hurry along ! Passengers for the Boat, all aboard please. And then to see a horse –drawn vehicle pull out and head inland, caused many an innocent to wonder if he’d been imbibing too freely. 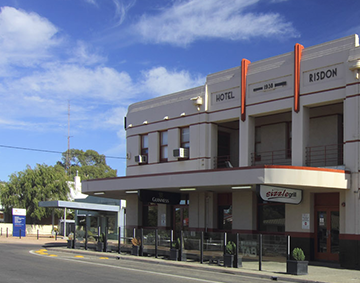 We hope you get an opportunity to visit the famous Risdon Hotel.